There are two different application processes for Higher Education and professional courses depending on whether it is a full-time or part-time course. Applications for full-time Higher Education courses must be made via UCAS – the Universities Admissions Service, quoting our UCAS Institution Code E32 - until Clearing is entered on 30 June 2019. Once you’ve decided on the course you are interested in, click the 'Apply' button from the course listing and complete the online application form. Alternatively you can access the online application form here and submit it. We will then contact you to confirm we have received your application. If you would prefer to complete your application in writing please click here to open and download an Application Form. Please print and fill out all the fields. You can then post it to us at the main College address or drop it in to Client Services. You can also get a copy of the application form by contacting Client Services via email at clientservices@esc.ac.uk, telephone 01737 788444 or by popping into the office during opening hours. Applications made after 30 June 2019 for all Higher Education and Professional Courses should be made direct to the College online or via Client Services (01737 788444). Interviews: Everyone applying will be expected to attend an interview prior to being offered a place on the course. To ensure we support students and protect their interests during the course of their study, we are required to publish our Student Protection Plan. The Student Protection Plan ensures that you are given accurate information prior to application and outlines the College’s responsibilities during your study. 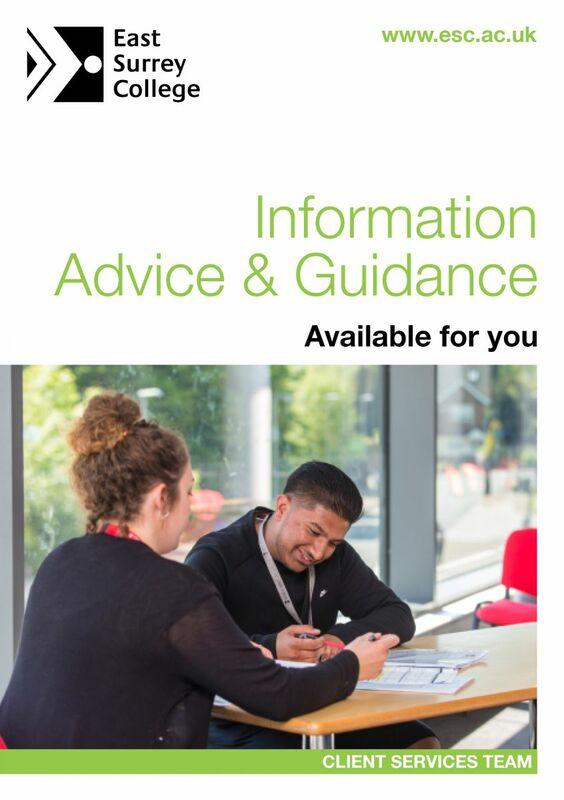 For all Higher Education courses, you are welcome to approach East Surrey College directly for an informal discussion, or to arrange to meet a member of the relevant course team. Unfortunately we are unable to offer places on Higher Nationals or Foundation Degrees until your UCAS application has been received. Different rules may apply during the Clearing period (early July to September), but this is subject to places still being available. As demand is high we recommend that you apply for your chosen course as soon as possible. You will be offered a place subject to meeting the published entry criteria for your course and satisfactorily completing an interview. For FdA Early Years Care & Education only, an enhanced CRB check will also be required. Any offer you receive will often have conditions attached. Please note that in Higher Education, an offer of a place is not necessarily guaranteed merely by meeting the basic entry criteria. Many other factors must be taken into account such as your evidenced potential to study at a higher level and the likelihood of you completing the course. As is common across Higher Education, the College reserves the right to make an academic judgement based on these factors. If you have Additional Learning Support needs, please discuss this with the College as soon as possible, ideally before you apply, so that we can offer suitable advice and support. You have the right to appeal an admissions decision. This should be made in writing to Client Services within 14 days of being notified that your application was unsuccessful. This is always done in consultation with applicants, and with the offer of suitable information, advice and guidance if applications have been received. Any closure will be organised by the Head of Department contacting applicants individually in conjunction with the course leader and Client Services. All such closures require College Executive approval and the Head of Higher Education is included in this process. The College does not close programmes once enrolment has taken place, but should numbers become very low, support would be given to those wishing to transfer to another institution on a case-by-case basis. If you wish credits awarded by another institution to contribute towards your course, please contact Client Services to make us aware of this before interview. It will be your responsibility to provide evidence as reasonably requested. On the most basic level, you will need to bring your certificates to interview, so a member of academic staff can record these credits and consult with their manager as to the likelihood of APL. They will also require evidence of the learning outcomes of the modules/units you wish to claim so they can match them against the course you wish to study at the College. You may be asked for other evidence that supports your claim, for example, reports from an employer or marked work. All cases of APL are very individual but basically require the College to collect evidence and assess this in a transparent and accountable manner. If it is not possible to transfer all or some of the credits, you will be given information, advice and guidance on why this is and what further actions you might have to take. The College follows the procedures for APL as laid down by its Awarding Bodies. If relevant, there will also be discussions as to the best way to integrate applicants into the second year of a course.